Back in early September we wrote a post, Keeping Charts Close, about ways to deal with chart clutter when wall space is at a premium and also suggested how to make charts more accessible to kids by using presentation easels and table tents. We were recently reminded of this need for alternatives to hanging charts up in the classroom when we presented a Smarter Charts workshop for the Cypress-Fairbanks Independent School District in Houston, TX where many of their school buildings have open-concept layouts and lots of windows, which means that walls are at a minimum. Combine this with very strict fire codes and you have a real chart challenge. We had brought some examples of our portable table tents and the teachers were thrilled at seeing some possible solutions to their chart dilemma. Then this past week, several of the teachers in our afterschool specialty group ( using charts to raise the cognitive demand on students) brought in examples of chart systems they use to keep charts up close to their students. They agreed to share them with our Chartchums teachers, so let the sharing begin! In order to help her EL students remember all that a true story should contain, Isabel Calderon, from PS/MS 5 in the Bronx, made small versions of the class chart and then attached them to construction paper that was folded into a triangle to create a free-standing place card for each table. A simple, quick, and inexpensive solution. This handmade table tent is light weight and portable, making it easy to place where needed. 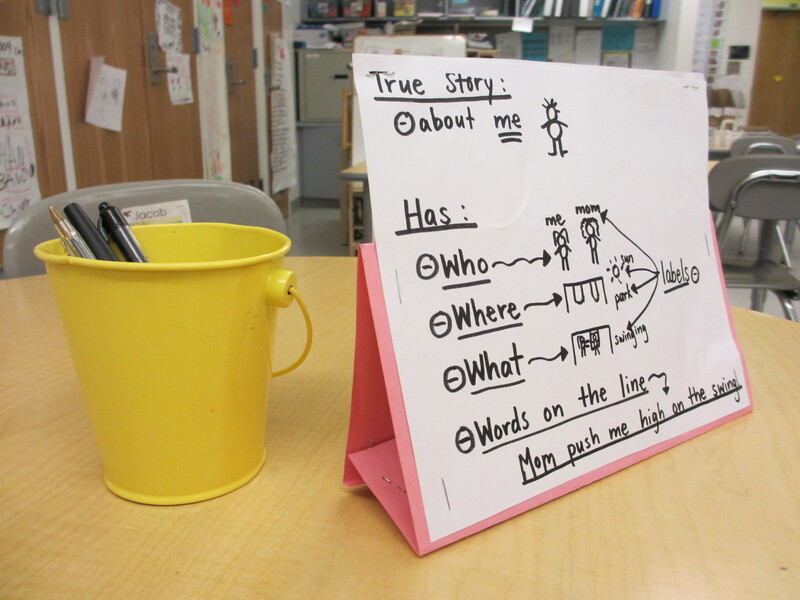 Valerie Geschwind, from PS 59 in Manhattan, found that her Kindergarten children needed lots of reminders when it came to some of the conventions of writing, like spacing and using lowercase letters, so she decided to put these reminders right in front of them as they wrote. She found a creative new use for some old bookends. She printed out copies of the class chart, “My writing is easy to read!” onto card stock and then laminated them. She stapled two together across the top and sides and slid them down over one of the bookends. Voila! 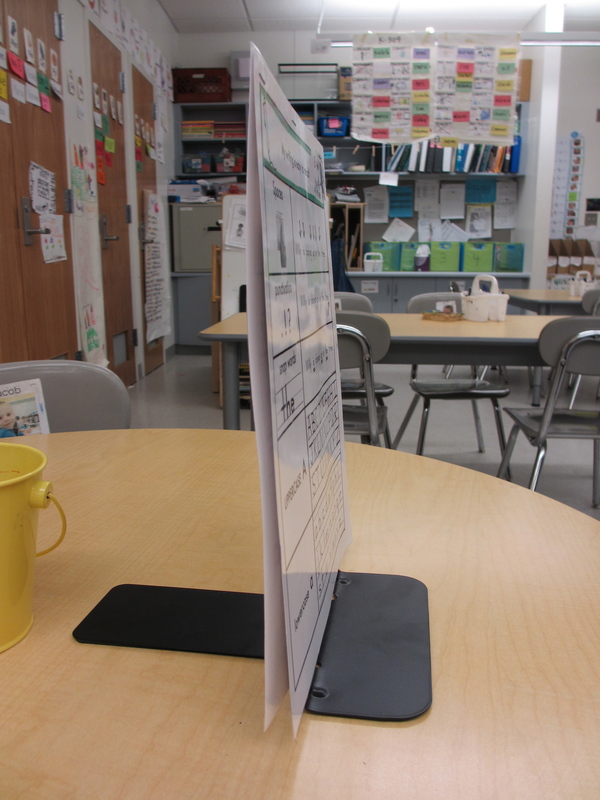 A freestanding chart stand for each table. 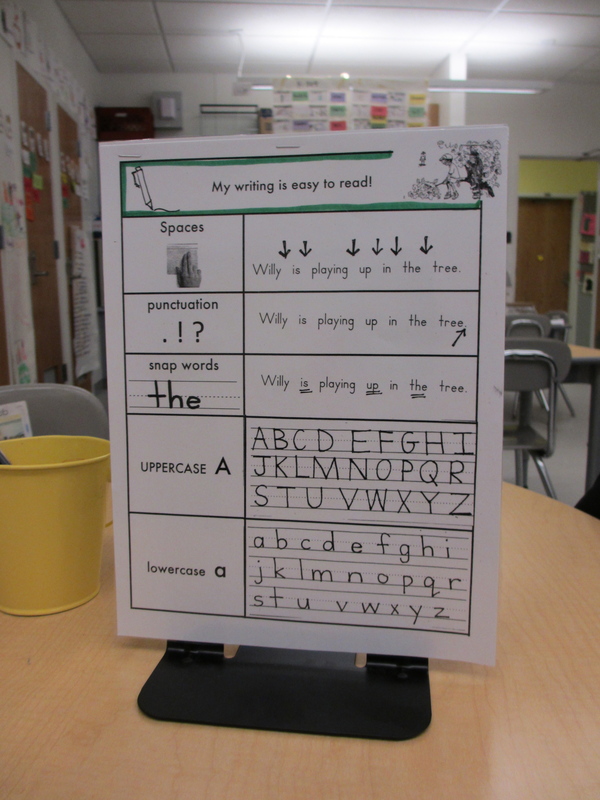 This is a typed version of a chart that encourages children to make their writing easy to read. This is a side view of the book end with the laminated charts slipped over. 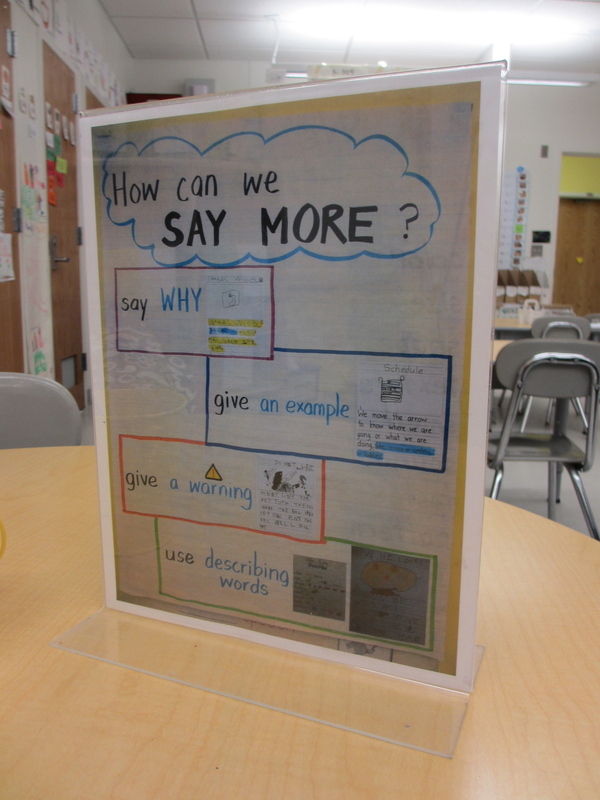 When it came time for her Kindergarten children to revise their “All About” books, Katie Lee, also from PS 59, decided to make the elaboration strategies she had taught accessible by first photographing her revision charts, then making color copies of them. She then made use of some 8-1/2 x 11 in. acrylic vertical stand-up sign holders (available from many office supply stores). She slid the photocopies in so the signs became two sided. One side gave strategies for how to say more, the other side included tips for adding details by using the senses to describe. What’s nice about these is they do not take up much space when placed in the middle of the table. 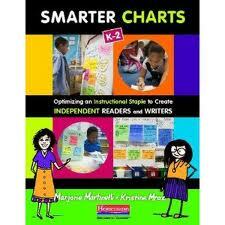 The charts can also easily be changed out for newer or different ones depending on the needs of the students. A photograph of a class chart was taken and then photocopied. This shows the other side of the sign holder with another photocopy of a class chart. So as you can see, challenging situations inspire ingenious solutions, or as Plato once said, “necessity is the mother of invention.” Thanks to all the teachers who continue to share among each other and we look forward to hearing about more clever ideas that result from trying to help children learn to help themselves. This post is so timely for my teachers! 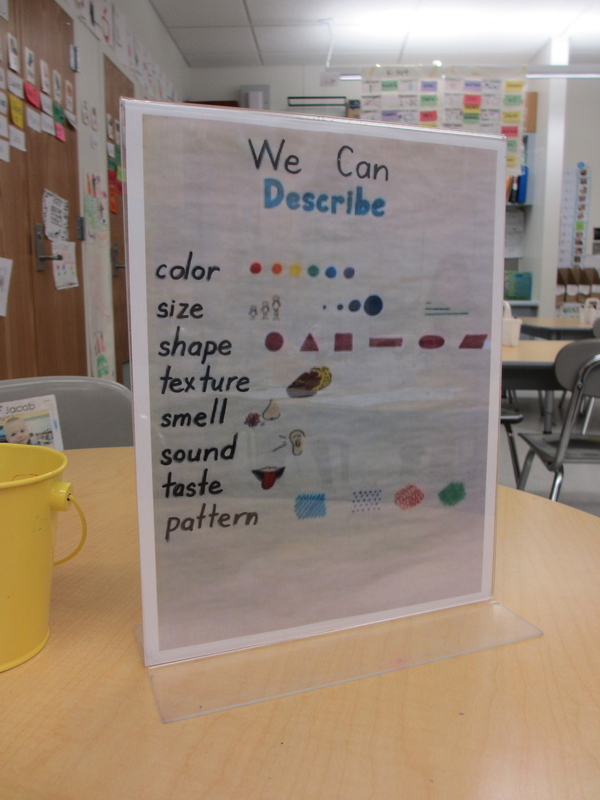 We recently did teacher walkthroughs using an environmental lens and so many teachers needed chart storage and reuse tips. Another idea that some of my teachers use is photographing the chart and bringing it up on their SmartBoards during workshops! Thanks for the great tips! I love your book and have used it all year so far! We love hearing about how teachers are using technology to support their charting work! I love using table top charts. I put mine in the acrylic 8 by 10 photo frames. They aren’t as nice as the vertical display stands but they are inexpensive and easy to find. I do have to trim the paper a little to make them fit.